My adorable son is now four months old, still a tiny bundle of joy. I look forward to us venturing outside for summer fun, but what if the pollution is bad that day? I desperately hope we don’t have another January-ish “airpocalypse” of extreme air pollution keeping our kids inside. I hope everyone is taking long summer breaks amid cleaner and greener pastures. But for us staying here in Beijing, what pollution guidelines should we follow when kids are at camp or playing outside? One major debate is choosing when to keep your children inside. I think a good baseline is to follow the action plans that most international schools use, with a usual AQI cutoff of 200 triggering cancellation of all outdoor sports — assuming no protective masks would be worn. We use these cutoffs because children’s lungs are still developing until around age 18, and as they exercise they breathe much deeper than usual, thus potentially causing more damage. What about air pollution masks? Since I last wrote about air pollution for BeijingKids, there was a very interesting new study published which provided the best evidence so far that wearing an N95 mask does indeed help to reduce air pollution’s unhealthy effects. They tested people walking around major roads in Beijing and had half of the group wear a 3M N95 mask. Those who wore this mask had improved blood pressure as well as heart rate variability, both of which are signs of damage from pollution. I think this and other studies should convince parents to consider buying masks for their children, especially when air pollution levels are over 200 AQI. The key is to use a real N95-rated mask. N95 literally means that mask is certified (in the USA) to filter out 95% of particles (PM) smaller than 2.5 microns — usually much smaller, at PM0.3. This means if the AQI is a crazy-bad 500, your mask is filtering 95% of that, and your actual breathed air is much healthier. But you must find a mask that is rated N95, not just a cotton mask or even just a blue surgical mask. If your child is planning any overnight trips or camping adventures, I think it’s wise to give them a good air pollution mask just in case. And if their day trip plans come into question because the air is bad, you don’t always have to cancel their fun — consider wearing a mask while they play. I know this entire idea of wearing masks is very tiresome and even controversial, and it certainly puts a damper on outdoor play. But as parents it’s our moral responsibility to safeguard our children’s health while living here in China. I recently tried a new mask for my 11 year old daughter. 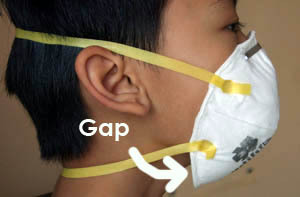 Its called the Infipure Invisible Air Mask and I found it on ijustwannabuy.com. Its great because its not like a normal face mask. It actually has 2 filters that are connected by a thin “invisible” plastic bridge. You just put it in your nose. At first it felt a bit strange for my daughter and I to have something in our noses. But after an hour, it felt pretty good. Better than the normal stuffy facemasks I’ve tried. And my daughter is actually willing to wear it! She thinks its much cooler than the ones that cover your whole face. So I highly recommend anyone looking for a solution to the awful bj air to try this! Richard, I’m desperately trying to find a face mask option for my one year old son. We’ve recently bought the infant Vogmask. The size is perfect – but at one year old I can’t explain to him why he needs to wear it and he simply pulls it straight off his face. I need something that little hands can’t remove. Any suggestions? At the moment I’m thinking about sewing the Vogmask into a balaclava or something that has to cover his whole head. Any advice welcome. Sorry, I don’t have an easy answer for this yet. It’s great that we finally have good masks, but I bet it’s tough for any toddler to put up with it. Sewing to balaclava may work but he’ll probably hate wearing that even more! It helps if the whole family is wearing a mask at the same time … perhaps the Beijingmamas Yahoo group may have some practical answers for us. My son is 8 months now and so far he likes the mask as a toy, but we still haven’t really tested outside yet. It got me when you said that it is best to bring pollution masks wherever you go especially if you have kids. As you mentioned, you won’t have to cancel the fun when unexpected situations arise. With that in mind, I will be buying masks for my family to be prepared in the future. Actually, my husband and I have noticed that the quality of the air outside has been really bad nowadays, so learning this information is perfect.